Here's the latest painting off my studio easel. This is one of my daughter's bantam chooks and it's my second chook painting. The first was Rudy which proved to be one of my most popular paintings - and apparently the most memorable as people kept reminding me of it more than a year after it was first exhibited. Awesome painting! I love how realistic your image is, right down to how the light strikes the feathers. 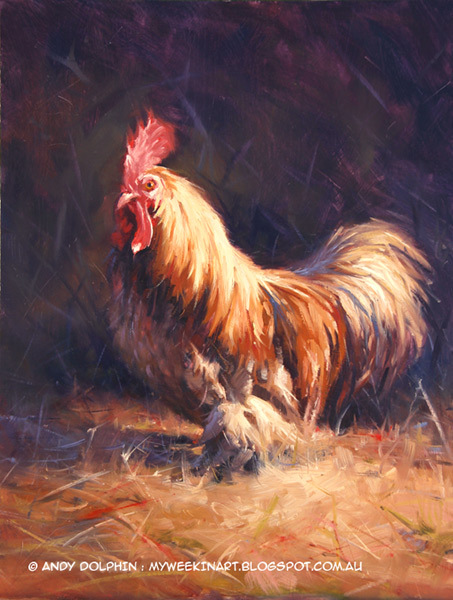 A chicken might be a common sight, but with the magic of your brush, you managed to make it fascinating. Thanks Aisha. The roosters have a certain majesty about them when they "strike a pose".